Summer Lodge01263 715779work01603 870304fax Self-cateringSummer Lodge is a charming property built in the 1980s, with its own small private garden and mooring, set on a quiet road within easy walking distance of the amenities that Hoveton has to offer. • Pets: No pets allowed at this property. • Luxuries: Flat screen TV with FreeSat, DVD player, smart card music system. • Utilities: Electric cooker, microwave, and fridge with icebox. 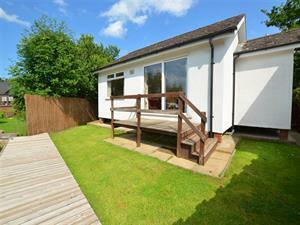 • Outdoors: Garden with lawn, decked area, table and chairs backing onto private mooring. Summer Lodge offers weekly bookings starting on Saturday. Summer Lodge is a charming property built in the 1980s, with its own small private garden and mooring, set on a quiet road within easy walking distance of the amenities that Hoveton has to offer.